Usually at some point in the summer, I feel the need to re-read a favorite series. I often feel guilty about this because my list of books for review is miles long. There are just so many books, but eventually, the draw gets too strong, and I succumb. For a few summers, it was Deborah Harkness's All Souls Trilogy. I thought about this summer, but I didn't feel the need. Last summer/fall, I re-read K.B. Hoyle's The Gateway Chronicles, and while I'm sure there are still gems to unearth I wasn't drawn to it either. I thought perhaps this summer I would not re-read anything. As I started reading slower and slower my review copies, I felt the first nigglings that I must re-read a favorite. But what? Then Harry Potter and the Cursed Child came out and the feeling got stronger. Then I need an item that was only a few dollars in order to get free shipping and I succumbed. I picked up Harry Potter and the Sorcerer's Stone. I never bought the series because I had plenty of friends with copies when the series was coming out. I did pick up a few of the others at charity sales for a dollar or two, but I didn't have book one. It has been a while since I read the series and there were a number of things that I had forgotten. Like, Lord Voldemort had reigned terror on the magical world for 11 years. There were also things that took on new meaning now that I know how the whole series plays out. In this re-reading, I also noticed the reading level more. I guess the first few times I was still absorbing the story, but between the many re-reads and the movies I almost know the book by heart. 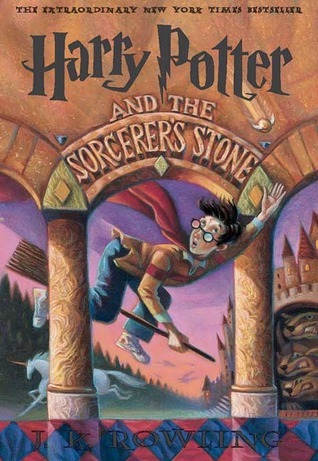 By Deathly Hallows it was questionable if the series was a children's book or not, but clearly, a children's story is what Rowling had in mind for book 1 when writing book 1. It is nice to see an author age the story and writing appropriately with the intended audience. I wonder if that is why Dumbledore's light capturing invention went from Put-Outer in book 1 to Deluminator in book 7. Or perhaps in the intervening years, he patented it and thought of a better name. I'm on to Harry Potter and the Chamber of Secrets. This has always been my least favorite of the series. I wonder if this reading will finally endear it to me. What books/series do you like to re-read? I don't re-read too many books. The few that I re-read are: The Prince of Tides and Beach Music by Pat Conroy and The Stand by Stephen King. Some times I just want to re-visit beloved characters. Other times it is because they are epic stories and I miss some of the details in my hurry to see how the story ended.